Do You Think That the Stall to Pass Immigration Reform by the U.S. Congress, Which Is Controlled by Republicans, Is Due to Racism? Issue of the Week LXXIX: Do You Think That the Stall to Pass Immigration Reform by the U.S. Congress, Which Is Controlled by Republicans, Is Due to Racism? An overhaul to the broken U.S. immigration system remains stalled because "the Republican base does have elements that are animated by racism," the head of the committee to elect Democratic lawmakers to the House said Sunday. Rep. Steve Israel's comments are in line with those from House Democratic Leader Nancy Pelosi earlier this week, in which she blamed racial issues for Republicans' failure to act on comprehensive immigration legislation. Asked about Pelosi's comments, New York's Israel said he agreed with her assessment. "To a significant extent, the Republican base does have elements that are animated by racism. And that's unfortunate," said Israel, who heads the Democratic Congressional Campaign Committee. Frustration is mounting among the House's Democratic minority and immigration activists about Republicans' refusal to act on a far-reaching immigration bill passed by the Senate last year with bipartisan support. The Senate bill would provide a path to citizenship for the estimated 11 million immigrants living in the country illegally and tighten border security. Republicans remain wary of a contentious debate on the divisive issue, which could anger their core voters and undercut potential electoral gains in the November elections when control of Congress will be at stake. "I think race has something to do with the fact that they're not bringing up an immigration bill," Pelosi told reporters Thursday. Oregon Rep. Greg Walden, who heads the Republican committee to elect House members, said blaming racism was "both wrong and unfortunate." He said his Republican colleagues have been critical of President Barack Obama and his party on policy grounds, not racial ones. "You know, there have been a lot of executive overreaches by this administration," said Walden who leads the National Republican Congressional Committee. "The American people just want to know the truth. ... They want to know answers. And that's all we're trying to do." 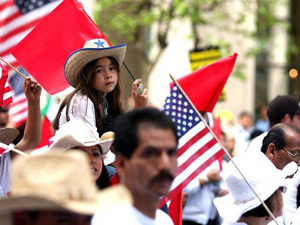 The issue of immigration reform was also a point of contention among potential 2016 Republican presidential contenders. Republican Sen. Rand Paul said potential White House rival Jeb Bush was inarticulate when he described immigrants who come to the United States illegally as committing an "act of love." In an interview that aired Sunday, Paul said that those immigrants "are not bad people" but added the United States "can't invite the whole world" inside its borders. Paul, the Kentucky Republican eyeing a 2016 campaign, says Bush should have kept his focus on controlling the U.S. borders. Bush, a former Florida governor, says Republican cannot demonize immigrants and should show compassion. He described illegal immigration as an "act of love" by people trying to provide for their families. Israel and Walden spoke on CNN's "State of the Union." Paul was interviewed on ABC's "This Week" during a visit to New Hampshire which holds the first-in-the nation presidential primary every four years. I think what the government of this country needs to remember is that it is a country built on immigrants. They always seem to forget this fact when deciding on the fate of the current ones. The country has slowly declined in power and now maybe a flood of immigrants which built this land can help restore it once again. According to the congressional budget office roughly half a million jobs will be lost when the federal minimum wage is increased from $7.25 to $10.10 next year for federal employees and contractors. If we can't even support 500,000 people that will lose their jobs what makes you think we can support 11 million more? And what you fail to neglect is that they are here illegally. Yes, this country was founded on immigrants, but, even the generations before us had strict standards they had to adhere too to enter the country. I have no problem with immigrants, but, to say we would like to allow 11 million immigrants who came here illegally is like saying "It's okay if you break our laws, we will give you a pardon and a cake to go with it". I agree with the last part of your post. If we allow these immigrants an easier citizenship process then we are saying that it is okay to break the rules to come here illegally and we will even help you after you have done so. Every immigrant should have the same path to citizenship and I don't think we should honor the illegal immigrants. I really like that you pointed out employees and jobs, ect. It's important to keep that in mind when wanting to allow immigrants into America. I truly hadn't even thought about this when I was placing an argument in immigration. If we can't pay who is legally here now, how will we be able to support millions of immigrants. It's a tough topic because i believe everyone should have a chance to come to America and create a new life but it's hard when we can barley support those who are already here. I'm not sure if you both realize how difficult and how much time it takes to come to the United States of America legally. Some families go through the entire process but still are not given access to our country. Also, some families are in immediate danger where they live and they need to escape to our country just to keep their children safe! I would do the same if I was in their shoes. Anything to protect my family. We had it easy - We gained citizenship just for being born here. I understand what you mean by not being able to support everyone, but we at least need to allow the children of these immigrants to be able to stay here. These kids are being raised here. This is their home now, possibly even the only home they remember, and if they are staying out of trouble with the law and attempting to get a college education then they are beneficial to our society! That is one of the reasons why I love Obama's DREAM Act. A wonderful movement. I agree, we tend to forget the past and focus on the now, disregarding how we all got to where we are in the first place. While I agree that we cannot just let everyone in all of the time, a bit more compassion and understanding is sorely needed. Considering the fact that we forcibly took this land away from Native Americans, then forcibly brought African Americans here to serve as slaves, the attitudes many Americans have adopted towards immigrants is ridiculous. It took CENTURIES for us to grant many minorities American citizenship, will this continue to be the case? I think it is absurd that people are taking such aggressive moral jabs at the republican party for this issue. I am a democrat, but I also recognize the complexity of this immigration reform issue. There are upwards of 11 million people who would be granted the opportunity to become citizens of the United States under this reform. Race aside, you have to understand that this is an enormous infrastructure change in the country. You cannot expect that the transition of gaining 11m citizens is going to be easy for the American government. Sure, it will be profitable once they begin cashing in on taxes from these immigrants, but up front, it will be extremely expensive. Because of how many variables are involved in this issue, I think it is irresponsible to say that the hesitation on the side of the republicans has racist sentiment. You make some very valid points and I agree with them. Allowing 11 million immigrants to become citizens is going to be a huge change and it will take time to adjust to such a change. That being said, I don't believe that the hesitation should be blamed on Republicans being racist. I personally do not affiliate with a party, but many of my values align with that of Republicans, and I don't think that blaming a political party is going move this along any faster. Like you said, there are many variables that lead to hesitations. I agree that Republicans are not the cause of all our problems. I'm sure there are many racist Democrats in Congress as well. It is a very complex situation and both sides need to strongly consider what would happen to this country if the reform issue is passed. Many people may lose their jobs because business owners can no longer pay illegal immigrants under the table and can't afford to actually hire them. There are many different variables that go into this issue and I do not believe racism is the key issue here. I agree with saying that republicans are not the only part of this problem. I also think its crazy that people are taking jabs at the republican party. I feel like just because we will not pass a law involving immigrants that people automatically assume that its a racism issue. Our economy is what is at stake with this law and it needs to be looked at on the economic level, not the racism level. Throughout history America has had strict guidelines for those who are eligible for citizenship. Those 11 million illegal immigrants are simply taking away the hardships that our ancestors endured. Why should one immigrant have to serve in the US military for citizenship while another breaks our laws and then gets the same benefits. This line says it all; "In an interview that aired Sunday, Paul said that those immigrants "are not bad people" but added the United States "can't invite the whole world" inside its borders". I completely agree that by allowing those 11 million illegal immigrants easier citizenship, it is almost punishing those who came here legally and became citizens. We shouldn't praise people who broke our rules because that will teach them that we think it is okay to continue breaking our rules. This is a complex problem, to be sure, but I think the real issue here is the inability for so many people to place themselves in the shoes of the people entering America illegally. I agree that citizenship for 11 million people is no small task and would take major adjustment and time, but I challenge any one person to say that they would not do the same for their families if they were not blessed as the large majority of us have been, being born and raised in the United States. For the fair share of problems our country encounters and endures, they are nothing compared to the struggles of the families that have entered the U.S. illegally, seeking a chance at a better life for themselves and their families. I certainly would not hesitate in making the same decision had I been born in these countries, and I believe we need to show a bit more compassion overall. I am not saying let the floodgates open and simply allow the entire world to come waltzing in, but the attitude on immigrants adopted by a large number of my fellow Americans is ridiculous. That is a good point but we also need to think about our interests too. Allowing 11 million people to become citizens would dramatically change our economy and culture in our country. Many jobs may be lost and unemployment rates would skyrocket. Yes, it may be difficult for these families and that is why they came here. But they should also consider what other hardworking immigrants have done. Illegal immigrants shouldn't get a free pass because they broke the laws of our country. It's ironic how we are worried that these immigrants will take our jobs instead of being concerned about the troubles these poor people are facing in their original countries. The government is quick to intervene in the Middle East to help people in times of war but are not willing to help immigrants who are starving and their lives are at risk every day in the countries they come here from. Instead of welcoming them and at least making sure their lives will be improved if they cannot stay in our wonderful country, they deport them. They send them right back to the places where they are in danger. Sounds like we need to get our priorities straight. Spending money and lives in countries far away but not even helping out in our neighboring countries. I like the statement in this article where is states "immigrants are not bad people but we cannot invite the whole world inside the US borders". To me this rings true in the fact that I think everyone deserves a chance to be in America... Seeing as America was built on immigration. But it doesn't seem smart to have everyone come all at once. Allowing so many immigrants may corrupt our economy and cause a drastic change in employment. I wish there was an easier way to figure his situation out. It's hard because illegal Immigrants break the law and it makes it harder for them to possess the same rules as Americans. It's not fair to allow these people to have the same rights as someone who has fought to be in America and done it legally. It is a hard subject to talk about. I do not think that the stall to pass immigration reform by the U.S. congress is due to racism. I think that many people see the United States as a land of opportunity, so immigrants come here to find that. An in fluctuation of immigrants is not going to help our economy, its going to hurt it. Many people will lose their jobs because of this. Like the article says immigrants “are not bad people” but the United States cannot “invite the whole world in”. So the stall to pass immigration does not have to do with racism, it has to do with our economy and not being able to support that many people in it. I feel like people look at this as racism because the U.S. will not allow people in, but sometimes you cannot let everybody in. We need to think of this on a more economic level then on a racism level. I also want to point out that its silly to think that republicans in general are the cause for all of our problems. Everyone should ultimately have the chance to live the freedom at the United States offers, but right at this point in time that is not possible with our economy hanging in the balance. We can barely support the people we have now in our country, and we cannot afford to let anymore in. I can see how it looks like it is due to racism, but i really don't believe that is why they are stalling to pass it. You're all right about the losing of jobs and what not, and that is probably their main concern. It is clear that the immigration issue is very controversial and there are a lot of emotions behind it. However, ignoring the immigration problem in America is not a solution. The Republicans cannot keep pushing this issue aside and hoping that it will go away. I think that both parties need to work together to find a solution that helps immigrants that are already here get legal and start paying taxes. People are not going to stop immigrating here so coming up with ways to deal with and help them is the best solution.